While you’re at it, let’s also explore viable alternatives to Excel for small and mid-sized companies. They (we!) are the sweet spot for software providers attempting to take that share. That is absolutely true, Connie. The functionality offered by the quadrant providers are available to SMBs in quite a lot of less expensive solutions feasible for organizations that requires lesser scalability. 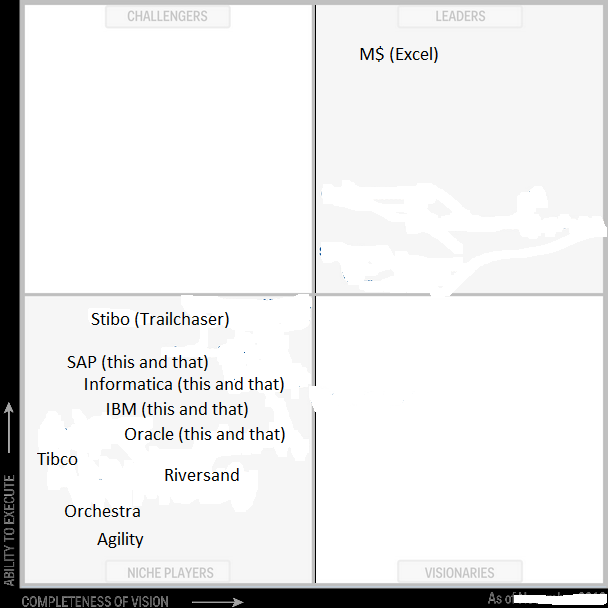 Agree with the analysis that the majority of Product MDM is “managed” in Excel but the axis talks about ability to execute and completeness of vision. It might be appropriate to overlay the original quadrant and put it on an axis of “amount of effort applied to managing product data” and inverse the “vision” axis. This would put MSFT in the top right corner. Thanks for commenting Jan. True, the position of MS Excel in this lighthearted post does not necessarily comply with the axis meaning (though somehow leaders in quadrants always are those with current market strength). And yes indeed, the problem with Excel is the total effort and ability to manage product data. I think the Leader, MS Excel, speaks volumes about the maturity level, or lack thereof, of most companies in managing their product data. While I would bet Amazon uses Excel or something similar, I would also bet its not their core PIM system and not the primary reason their delivery of product information surpasses 90%+ of retailers. Thanks for commenting Bill. I agree. It’s a matter of maturity and shifting the balance between anarchistic use of Excel and rigid use of a PIM/MDM tool and organizations around are at different stages in that journey – and PIM/MDM tools are at different stages in supporting that journey by the way. And so to add my two-penny worth – the fact that organisations are always at different stages of their MDM & PIM journey is the very reason we designed Semarchy MDM the way we did. It’s the ethos behind “Evolutionary MDM”. i.e. to allow the application to grow and evolve as the organisations ever changing requirements dictate.